I started baking at a very young age. I was about seven years old when my mom showed me how to bake a basic two-egg cake with butter icing. It was my task to bake one every Saturday and it would be dessert after dinner that night and the other half would be our after church coffee time treat on Sunday. Another cake she taught me to bake was this Spice Loaf. My mother had this recipe printed out in a spiral bound notebook and, once I was old enough to read and understand what I was reading, I realized that she had made an error in writing out the recipe, understandable, really, in that English is her second language and, at that time, it was a new language to her. Instead of writing cloves, she had added an “r”, and the recipe called for 1/2 tsp clovers. I teased her about it for years! Apart from one egg, there’s no added fat and a lot of yummy spices. Having said there’s no added fat, my favourite way of eating this is by the slice, slathered with copious amounts of butter, and accompanied by a cup of tea. ETA: Well, I am astounded. In all the years I’ve been baking this loaf cake, I have never (and I do mean never) had it fail. Until this time. I’m not sure what happened but I decided that, in the interest of brutal honesty, to let you know that it does happen. I think it may have been a combination of contributing factors. First, I’ve not made this cake in the time that we’ve lived here in this house and this oven, an old one, bakes on the hot side. If I take that into account, and the fact that the recipe, as written, calls for an oven temperature of 375º (a hot oven), it was probably baked at too high a temperature. As well, I should have moved the oven rack up one notch but I know that this cake can rise quite a bit. This time, it rose and burst, and batter oozed out of the side in an almost obscene display. Then, when it was time to remove the cake from the pan, it stuck. And when I say stuck, I mean as if it had been glued into the pan! I did get it out eventually, with the air filled with colourful language. It is still edible, though, and as imperfect a loaf as it is, it is still delicious, even if the edges are a bit on the black side. Don’t let my failure this time stop you from trying this loaf; it really is a tasty treat. Just make sure you butter the loaf pan; I sprayed it with olive oil but that obviously wasn’t enough. As well, I’ve lowered the temperature to 350º in the recipe. That’s a better temperature for a loaf like this one. 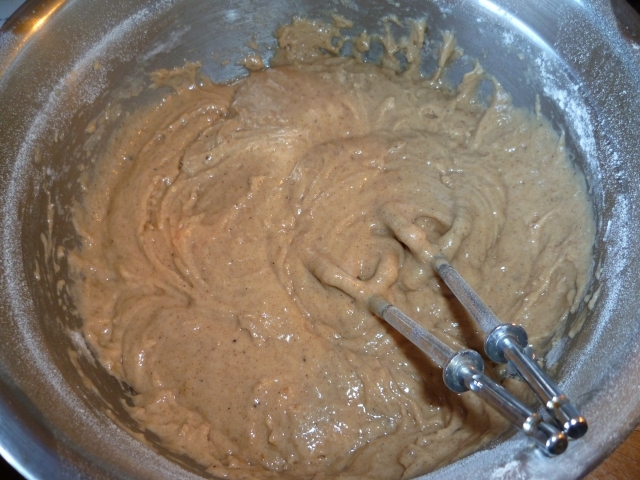 In a large mixing bowl, mix all ingredients until well mixed and smooth. Pour into a well greased 8 inch loaf pan and bake at 350ºF in the centre of the oven for about 1 hour or until a toothpick inserted into the centre of the loaf comes out clean. Remove from pan and allow to cool on a rack before slicing. I am bored with my daily lunches. Lately, there have been very few leftovers that were appealing enough to take to work to reheat and each time I open the refrigerator, I wince, close it, and grab something from the deli down the street. And you know I’m never happy with what I get. Occasionally, it’s the Thai Chicken soup, which is usually pretty good unless someone’s added way too much curry paste, making it so spicy you can’t taste anything else. Or it’s a sandwich that has so much processed meat on white bread that it’s nothing more than sodium riddled white bread. This morning, I sat down at my computer and started searching for lunch ideas, for something that would make my mouth water, to make me look forward to my lunch breaks. I found a few ideas, things I’ll be making in the not too distant future. Then I remembered that I have a recipe for Red Lentil Dal, an Indian red lentil soup/stew. I’ve been trying to remember where I got the recipe and I’m afraid I can’t find the web site now. I think I found it through Punchfork, but I’m not positive. If I do figure out where I got it, I’ll add the acknowledgement to this post. In any case, here it is, for your taste enjoyment and, for me, a few days of yummy lunches! Stir together the spices, salt and pepper in a small bowl. Heat the oil in a large skillet over medium heat, add the onions and cook, partially covered, stirring often, until they soften, about 5 minutes. Stir in the spice mixture and cook for a couple minutes longer. Stir in the ginger and tomatoes and cook, partially covered, until the tomatoes have softened, about 5 minutes. Stir in the lentils and stock and bring to a simmer. Reduce the heat to low, cover and cook until the lentils are soft and the mixture is thick, 20-25 minutes. Remove from the heat and stir in the lemon juice and cilantro. Ladle into bowls and top with a couple good dollops of yogurt. I love spicy food. Now, before you assume that I’ll eat anything that’s mind-blowingly hot and spicy, let me assure you that you would be terribly wrong in that assumption. I like spice, I don’t like hot. I like to be able to actually taste the food I’m eating. If it has a lot of hot chillies in it, you can be guaranteed I won’t like it. But give me a bowl of something like Chana Masala and I’m in heaven. Last weekend, John and I went to the library and I came out with an armload of cookbooks. One of them, “The Big Book of Curries, 365 mouthwatering recipes from around the world” by Sunil Vijayakar, is a temptation of spicy foods and I’m finding it fascinating. 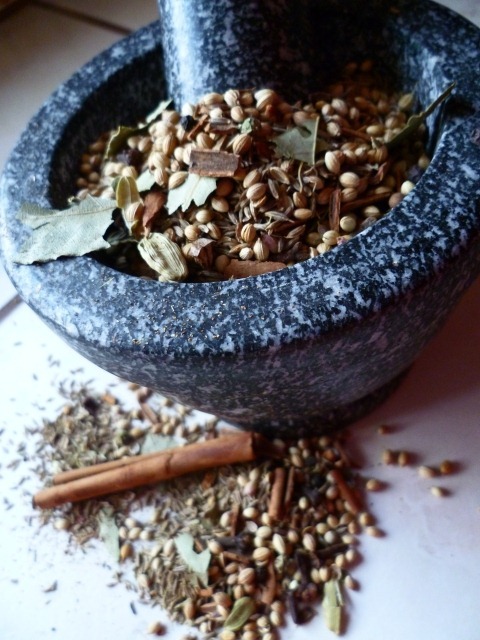 The book begins with a section of recipes for making your own spice blends, both dry and paste. I decided to try making the Garam Masala, and to make it the more traditional way (I assume), using the mortar and pestle I bought last week. Oh my! The scent that filled my kitchen as I heated the spices slowly was intoxicating and magnificent! I did that part last night and allowed it to cool until this morning, when I ground up the spices in the mortar and pestle. I must say that using the M & P is fun! It’s almost meditative watching the spices turn from seeds and pieces to a powdery, magnificently scented conglomeration. Even the physicality of using the mortar and pestle, though I can feel it in my arm and shoulder, is equally meditative and rewarding. 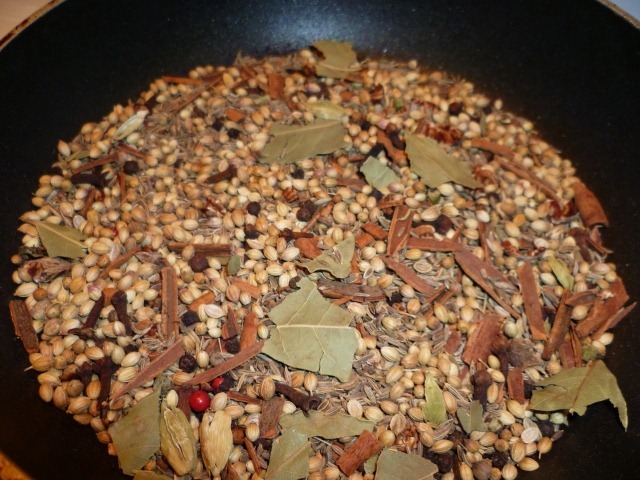 I haven’t used the Garam Masala in anything yet, but I do have a couple of recipes lined up to try. I’ll post the links to those recipes at the end of this post. 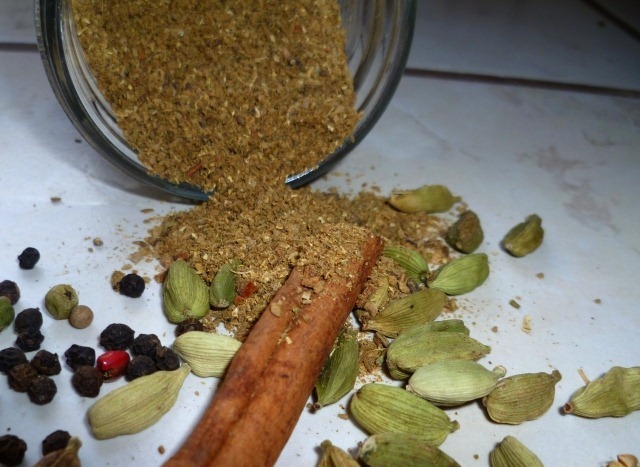 In the meantime, here’s the recipe for the Garam Masala. Put all of the ingredients in a large dry, non-stick skillet and heat over low heat, stirring continuously, 4-5 minutes, until fragrant. Remove from the heat and leave to cool. Transfer to a small blender or spice grinder and grind 2 minutes until the mixture forms a fine powder (or use a mortar and pestle). Use immediately or store in an airtight jar up to 1 month or in the refrigerator up to 3 months.